An ancient tea tree dubbed “Ancestor Tea” grows in the tea forest in Giang B Hamlet in the northwestern province of Yen Bai’s Suoi Giang Commune. The roots of the tea tree are bigger than one person can hold. Its luxuriant branches stretch up to 20sq.m. Experts say this probably is one of the oldest tea trees in the world. 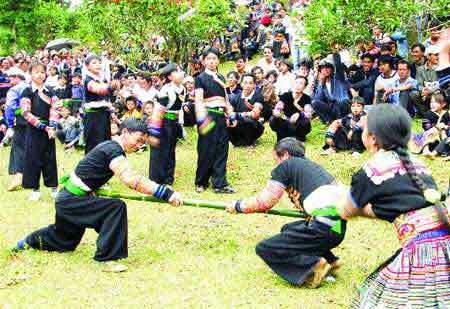 Since long ago, Suoi Giang people have worshipped the tea tree and its owner – the oldest man in the hamlet. Offerings like a rare Mong black rooster with black feathers and black meat are dedicated to the tea as well as the hamlet deity and ancestors. 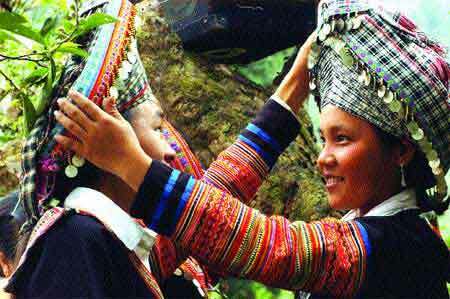 When praying, local ethnic Mong people ask for bumper crop and good health year-round, both for themselves and for the tea forest. Crop circles: Villagers worship the Tea Deity to pray for a bumper tea crop and ask the deity to keep people healthy and wealthy year-round. Face off: Mong girls do one another’s make-up under the tea tree’s shade. Everyone is roped in: Tug of war is a favourite game of the Mong people. 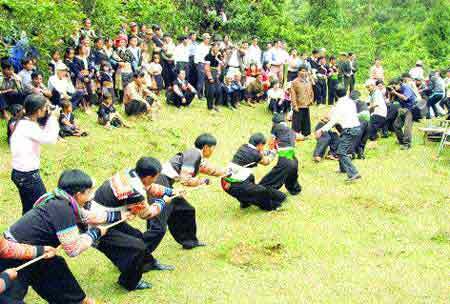 At loggerheads: Stick pushing, a traditional game of Mong ethnic people, often played after the worship ceremony.